This is the fourth part in a continuing series of my younger self abroad. While abroad, I was also applying to different college to transfer to a good theater program. All black and white photos are my own and all color are courtesy of my sister, Mel Stone. Hipster fashion is really big here. Considering that America stole a lot from British fashion in the ’60’s and all, now they seem to have taken an awful lot from us. I saw a lot of hipster fashion today in the quaint college-ish town of Guildford. Mel and I were interviewing for the technical production course at the Guildford School of Acting Conservatoire (we were referred by Adrienne, a batshit crazy theater professor we had at Santa Monica College). First, we had to get to Guildford, and our cousin Anita was kind enough to drive us as the main school address was not the address of the technical workshops and classes. Mel and I were trying to give directions from a map in the backseat and failed miserably. We finally found the proper place, a small, inconspicous-looking building next to a Porsche garage and a Travelodge motel. I could go into the details of the interview and the tour, but I don’t think I will. I’ll just say that there is a lot for me to think about, and the heads of the school, Peter Barlow and Adrian Hall, are very funny British men. It would be interesting to study theater in Guildford though! I’m waiting for my turn in the shower so I thought I’d finish up about yesterday. 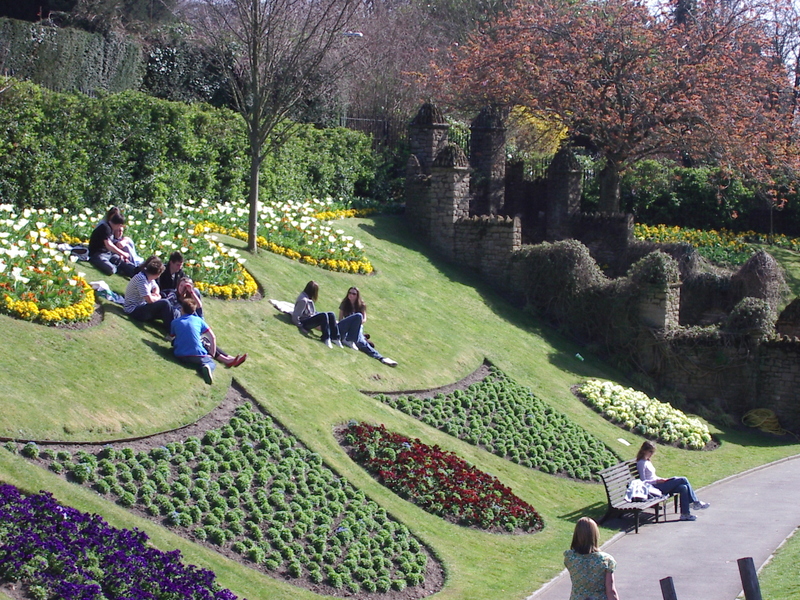 The town of Guildford is cute to the extreme. It’s exactly what a cute English town should be. A river with boats and painted bridges, cobblestone streets lined with shops with squiggly little alleys leading off from them, a small castle with colorful gardens. Cute little chimney stacks like Mary Poppins. After our interviews, Mel and I met Jill and Sara at a grocer’s, Sainsburys on High Street, to buy a peasant’s feast of grocery store food. We crossed back over the river and ate on a bench looking at the water. We had sandwiches with ham, egg mayonnaise sandwich filler, apples from a street market, “creme caramels” which were like flan, and apple juice that was “naturally cloudy” (aka unfiltered. I prefer the sound of naturally cloudy though). We also got some Cadbury creme eggs, which we had been craving since the Guildford students had been having their Easter egg hunt in the buildings during our tour. After lunch, we all just relaxed. Which was nice for a change! When we were ready to move, we went back to High Street and window shopped. It’s funny, there are a lot of American stores and restaurants here. The other day, my younger cousin Tilly asked me if we had KFC in America. My response was something like “Are you kidding?? It’s called Kentucky Fried Chicken! It comes from America!” Anyways, there was a Claire’s Accessories on High Street in Guildford and we went in for shits and giggles since that was the place to go when we were in middle school. We ended up going in on 3 pairs of earrings so we could get the third for free. Mine are sort of faux vintage/hipstery. Jill was getting antsy to see the castle, so we went to find that. Her motto is “Leave no castle unexplored!” But now it’s my turn for the shower, so we will have to explore it later. We slept in really nice and late today. We were originally going to visit Hampton Court (Henry VIII’s castle) but since we are going to London early tomorrow we are going to lay about today and do laundry and such. I’m a little miffed about missing Hampton Court, but it was expensive anyways so this is better. So when I left off we were at Guildford Castle. It was pretty tiny. We walked around and looked at it, then flopped on the grass in the gardens. It was a really nice day, and actually warm for England in April. It was there that our friend Seong found us! He went to high school with us, and now studies at the Guildford Conservatoire where Mel and I interviewed. When he talks now, it is with a British accent that comes and goes. Sara said that’s because in class they wouldn’t let him speak until he could do so with a British accent. He took us to the local pub, the Brittania, where all the Guildford students go. There were a lot of them there, celebrating the end of term. When Seong spoke with them, his British accent would take over, but the American would slip back in with us. Jill, Mel and I all wanted draft beers, and the bartender recommended Carlsbergs, so we gave it a go. It was good stuff! We had to go if we wanted to make it home to my cousins’ for dinner, so Seong walked us to the station. He seems to be doing well. He hates the weather and they work him hard, but he seems happy. Once we got off the train at Wimbolden Station, we realized we would have to take two buses at 4 pounds each. That’s a lot of cash to get home. So we decided to take one bus to Sutton Green and then find our way back. Or rather, wander back. Although this sounds like a ridiculous plan, miraculously it worked, even though we got off at the wrong stop in an area we had never been before. We were able to figure out where we were thanks to the pubs that we recognized. Hopefully pubs shall continue to work wonders for us during our adventures. Finally made it home to a spaghetti dinner, and crashed. That was Thursday. Friday began with us oversleeping. But then again we never were on that strict of a schedule so it was alright. Then we went into London for the day. Our first stop was Shakespeare’s Globe Theatre. I had been before, but man is it cool! We took the tour and our guide Simon was really good and interesting. I’d love to put on a show there. The stage is painted to look like Italian red marble, with the signs of the zodiac painted on the ceiling and other opulent, Greco-Roman decorations. Some people might find all of this color and decoration limiting, but I find it inspiring. There was a groovy exhibition on a lot of their past seasons and some of the costumes and stuff. I loved the segment on costuming a man to play Cleopatra. He came out very pretty, actually. They also had some people doing a sword demonstration. Jill ended up talking to them about her fencing stuff and they invited her to come practice with them! 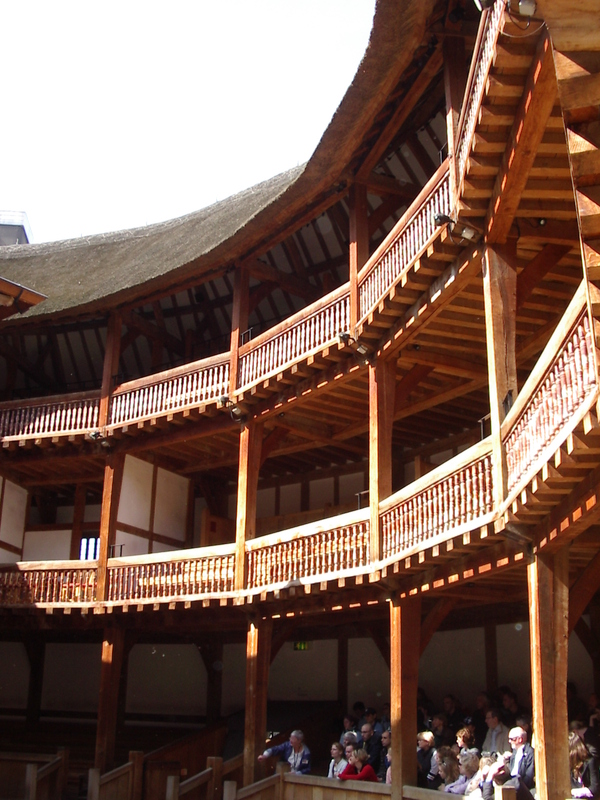 So tomorrow we are booking it back to London in the morning so that Jill can play with swords with the people at the Globe. I’d be shitting my pants if I got such an opportunity. I wish we were going to be here in May when their season begins. It’s their “Venetian Season”, and they are doing Love’s Labour’s Lost, The Merchant of Venice, and something else that I can’t remember. For lunch we got hot dogs from a cart outside the Globe and finished the rest of the apples from Thursday. We were originally going to go to a grocery store, but Sara has this “I’m hungry and I need to eat right this second” thing, so the hot dogs provided more instant gratification. And they were gratifying indeed. 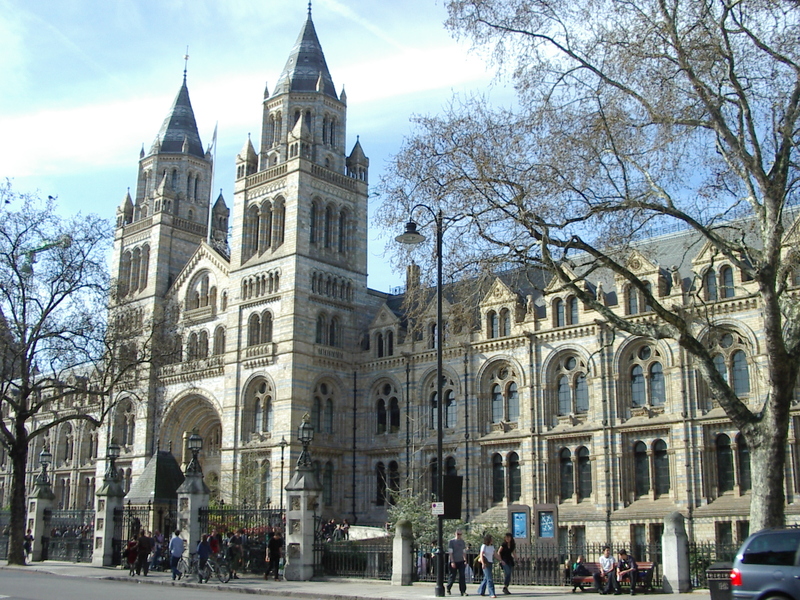 From there we went to the Natural History Museum in South Kensington. Mel really likes that kind of stuff, and it was free. Originally I was skeptical as to how cool it would be, but it was amazing! 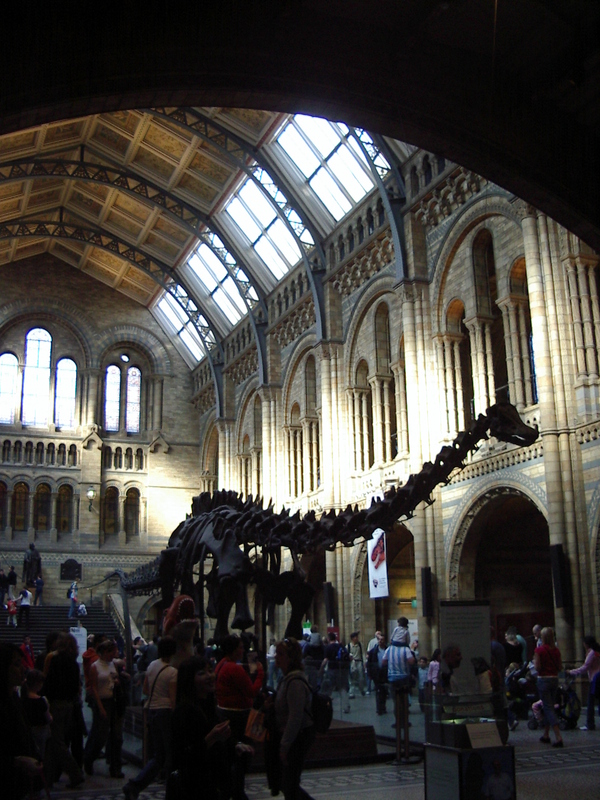 The building is this grand old thing that looks like a church from the 1700’s or 1800’s, and in the main hall there is this huge dinosaur skeleton admist the swoop of the architecture. The animal displays were interesting as well. We were intending to catch a play that night, so we had an early dinner in Bayswater. Three years ago, Sara, Mel and I had been on a drama trip and ate at this Lebanese place all the time, and somehow we found it again! It was just as good as I remembered, and we had cheap hummous with pita, samosas, and fish and chips. I’m making myself hungry now. I’m going to go make a sandwich, and finish this day later!